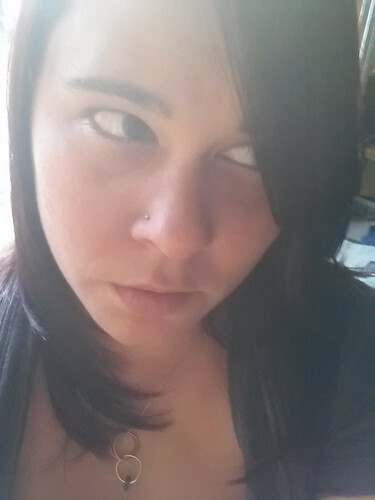 Get to Know Your Zinester: Shards of Glass In Your Eye! Starting at 2 am one night in August, 1995, I whipped out Shards of Glass In Your Eye! #1 overnight in a fit of creative frustration. It was a cut-and-paste 12-pager, made with MS Word on Windows 95, a new-fangled laser printer, and a stack of old magazines lying around the house. The project was sudden and nocturnal, and I didn’t have glue to stick on the components. So I made a paste out of flour and water and spread it really thin. My mom sneaked off a bunch of copies at work (thanks, mom! ), and I distributed it all over my rural Michigan town. What was Shards #1 about? It was a bunch of half-baked adolescent political rants (one aimed at Newt Gingrich), poems, and random. There is a news item about a man dying from a scratched finger in 1906, lists of movie and book recommendations (I think they still hold! ), quips, and games. I even call out Ralph Waldo Emerson for his inconsistency, if you’re into that sort of thing. 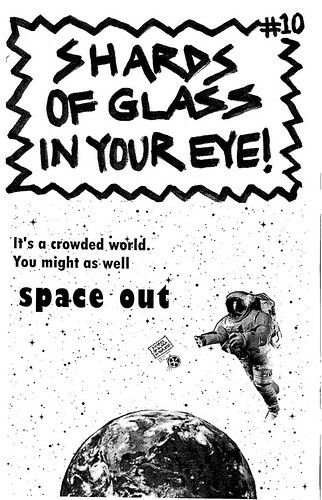 Shards of Glass In Your Eye! #10 (August, 2013) is a fine vehicle designed with your comfort in mind. You’ll luxuriate in plush, yet cheeky, career advice. The Goodyear Blimp inspires a smooth ride. Cheap beer helps you corner like you’re on rails. Come take Shards #10 for a test ride at your local LA Zine Fest 2014 dealership, and get a rebate of a free custom button! Just mention this interview (for serious!). Shards #10 is perfect to present to your significant other on the driveway on Christmas morning, wrapped in a gigantic red bow. Who needs a Lexus, when Shards #10 will make it a December to remember? Ride, baby, ride. Fran Lebowitz. She wrote two excellent books of humor essays, almost 40 years ago. I first read them when I was 16, and was inspired to take my odd observations and turn them into essays and bits. Gene Weingarten. He’s the humor columnist for the Washington Post, plus he won a Pulitzer Prize a few years ago. Gene is brainy and cranky, yet good-hearted and fun for everyone. Well, most. Los Angeles. So many people talk about how difficult it is to succeed as a writer, but I see it every day in Los Angeles. A large portion of the entertainment industry is based on creative writing. The odds are small, so some say it’s all about luck and who you know. But you still have to work hard, and write hard, and work a little towards your goal every day, or you got nothin’. Seeing so much success around town reminds me that maybe, someday. . .that could be me. Los Angeles keeps me dreaming! I’m constantly observing what’s around me. I’m a neuropsychologist by training. I’m always aware of the fact that unique experiences create new connections in the brain, so you have a different way of seeing the world. For me, that’s key for creative writing, so I’ll do things like purposely vary which grocery stores I go to. In the sense that I am always scanning my world for its quirks and new information, I am creating constantly. And if you think about it, so is everyone! Our brains won’t let us stop creating. I’m so glad zines allow an outlet to shape our observations and share them with the world. For more info about Kari’s zine, check out her page on ZineWiki!